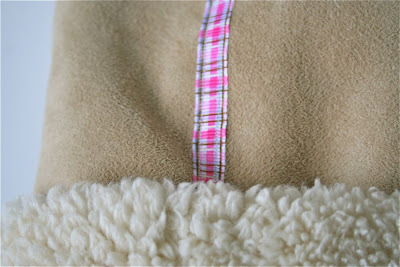 So I was beyond excited when I found this fabric - it's microsuede on one side, fuzzy sherpa on the other. So the one side is velvety soft and other is incredibly marshmallowy soft. Like wearing a fluffy cloud - could there be anything better? I doubt it. Super durable too. And the best part? I got it on sale, so a half yard needed to make these for my little girl was just $7. Wayyyyy better than $25 and there was enough left over that I can make some cute little matchy shoes or slippers. When I get a hot second to work on them that is. And I've been a bit short on hot seconds (or even room temperature ones) lately. 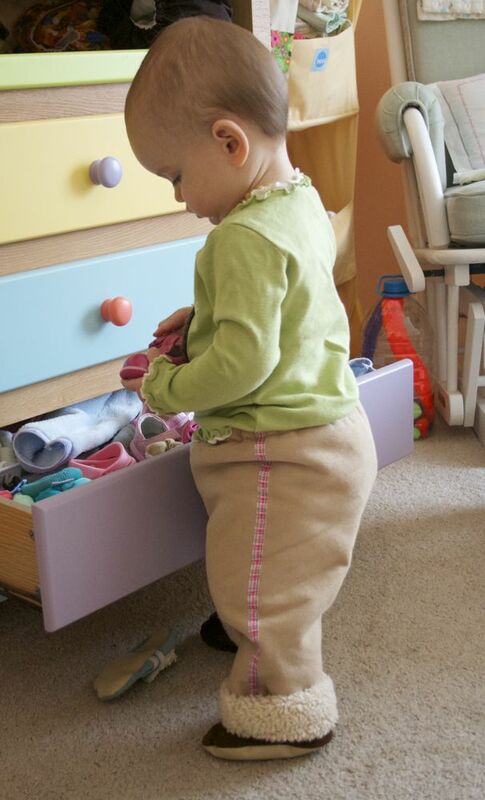 I used a basic pant pattern and added a little color by stitching some ribbon down the sides of each leg. 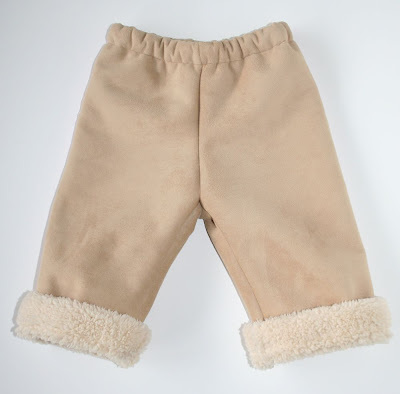 By adding a bit of extra length and turning the hems outward instead of under, I also added a little cuff so the sherpa gets a peek out of the legs and can be rolled down as she grows so they get a nice long life. After I made these I knew I needed to get more of this stuff and come up with something for yours truly. It's just the perfect fabric for feeling warm & fuzzy all day long. The plushness level of the fabric does make these a little on the poofy side though, so using it for pants isn't the most flattering if you're female & over the age of 10. But I've got a yard of it just waiting for the ideal use to occur to me. And even if it doesn't, should this weather stick around I may care less about poofy & more about cozy anyway. Any ideas for making myself something chic & warm out of this heavenly fabric? Go ahead and share 'em in the comments! But your little one looks just darling! Oh, those pants are just adorable!!! What do you think? If you want to we could team up and do it together ... I really want to make one for myself but I have not made the pattern yet - just the small one for my daughter. Having someone else join might just give me the push that I need to actually finish it! Apart from a tote that would be the first thing I actually made for myself! :-) Usually I always make things for other people - crazy right? I always make things for myself last, so that's why I'm stumped on ideas with this! A Hooded scarf is a good idea. In defense of making them into pants (maybe because I really want some), a slimmer style of pant may reduce the poofy-ness a bit. I think a cozy vest and matching hat with earflaps would be perfect in this material! I am a new follower from Boost your Blog Friday! Love meeting other crafty people! How adorable! They look so warm, too. Ahhhh, those are so cute! My bonus daughter would just love these for her new baby!! I think you should make a hat for yourself! Who cares if they have a fat head - it just makes everything else look smaller! I love those. I want some for me! Those are really cute Cheryl! Where did you get the fabric? 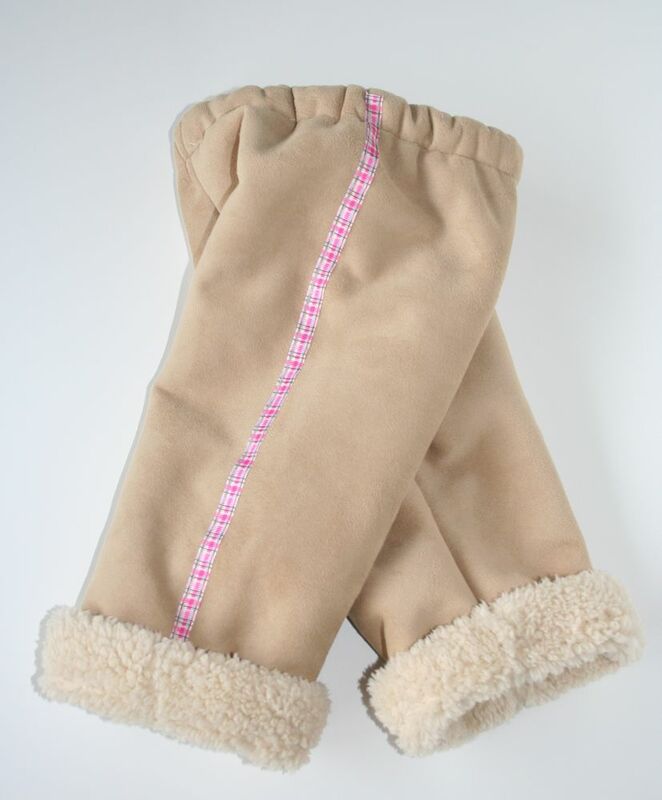 These look so toasty warm. They look darling on your girl. Ooooh! I want some in my size. I want a whole bodysuit made out of them. I'm always cold and this fabric is making me warm just looking at it! The pants are adorable and practical - great job! They are adorable on your daughter! So warm and cuddly! Adorable! Look Comfy and warm too! Leg warmers? They would only give you extra credit on your legs while still being cozy. Answer to SuzyQ: I got mine in October 2011 from WalMart, believe it or not; but I found it online at the Fabric Depot, Portland, Ore., also. I found it in ivory and chocolate suede colors. Both colors had the same color sherpa fleece on the other side. Good luck! I vote for vest and hat. If you keep your body core warm, all else stays warm, also. A hat is very important, because one loses body heat through the head many times faster than from any other part of the body. Old Skiers' saying: If you hands and feet are cold, put on a hat!!! I NEED YOUR HELP. 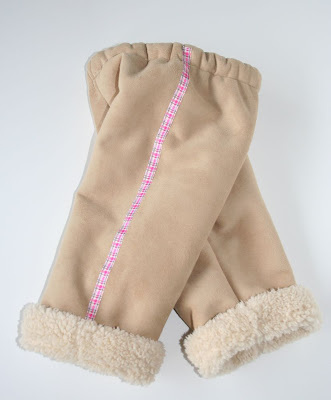 I NEED TO KNOW if this fabric needs to have the edges finished in some way, such as serging, or if the raw edges (like the sherpa seams showing on the suede side of your boots) have to be finished in some way. I need to know NOW, so I can make the bed coverlet I have cut out from this stuff. Susie Q - I got my fabric at Joann's in the faux fur section. Using a 40% off coupon makes it very affordable. Claja99 - The edges are unfinished this kind of fabric doesn't fray so there's no need to finish. I do recommend shaking it out thoroughly after cutting and putting in dryer on fluff setting to get rid of the fluffy bits that can come off when it is freshly cut. I know this is wayyy after the fact, but a cozy skirt would be cute too! Thanks for your posts. I found some on clearance at Walmart this summer and I was waiting for the perfect project. I like your ideas. Thanks - it reminds me that after almost 2 years of wear these pants are now getting too small. Time to make some more!